Embossed Brown 5 inch Leather Knife Pouch. 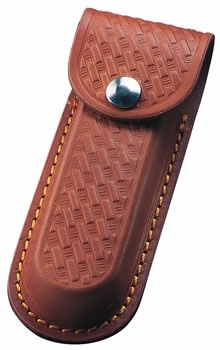 This sturdy brown leather knife pouch is embossed with a basket weave design and fastened by a large press stud. It accommodates a knife up to 5 inches in length and features belt slots. Will accommodate some Leatherman models.